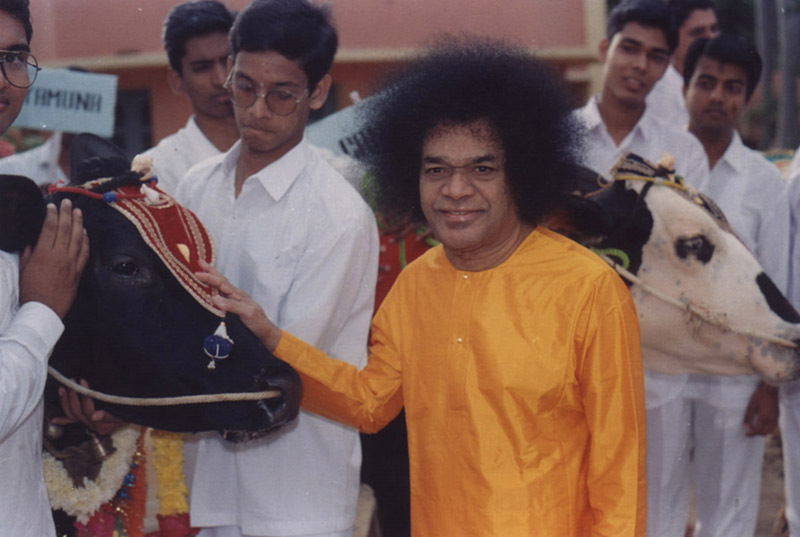 One aspect that Bhagawan has always stressed on in most of His Discourses is the richness and the wisdom of the ancient Bhaaratheeya culture and traditions. It is very important to note that “Bhaarath” according to Bhagawan is not a country with geographical boundaries. It is indeed a way of life and therefore anyone who follows this “way of life” is a true Bhaaratheeya. In this posting, we will hear Bhagawan talking to us precisely about this point. Also, Bhagawan gives a number of examples of ancient Bhaaratheeya traditions, demystifying the myths associated with them and explaining their true significance. In many instances the true significance is spiritual in nature whereas in many other cases, the underlying principle is very scientific and intended for human welfare. Understanding the true significance helps us go beyond the mere rituals and experience the “spirit” behind them. Adding the “spirit” to mere “rituals” makes it “spiritual”. However, there are certain examples which are very relevant but unfortunately the audio version of the corresponding Discourse is not available. Hence, these have been presented only in text format with appropriate references. If anyone has the corresponding Discourse, please pass it on to hismessagehisvoice@gmail.com so that we could include the audio clip for the same. In no way is this compilation exhaustive. Bhagawan has spoken so extensively about Bhaaratheeya culture and traditions that it would be impossible to include all points in one post. We would therefore bring you more posts on this topic in the coming future. 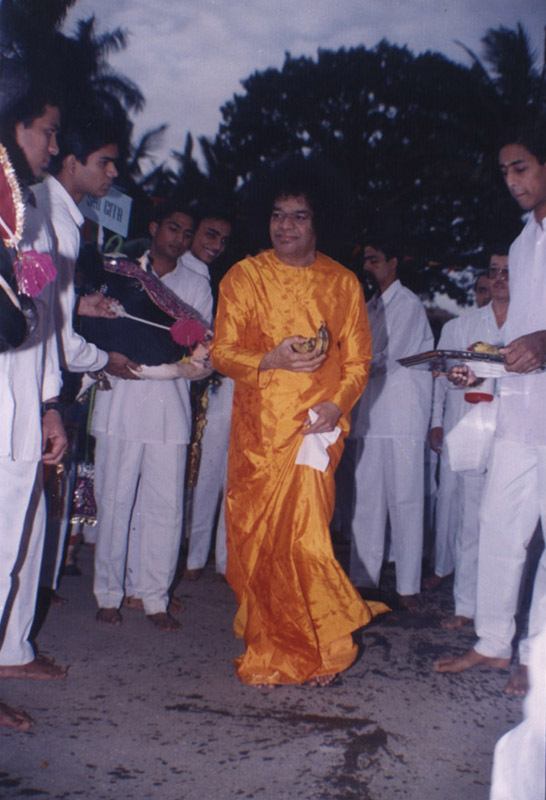 There are fourteen excerpts from Bhagawan’s Discourses presented in this post. Of these 11 excerpts have audio clips while the remaining 3 excerpts do not have audio clips. These have been selected from Discourses given by Bhagawan Baba during the years 1966, 1972, 1986, 1991, 1997, 1999, 2003 and 2004. 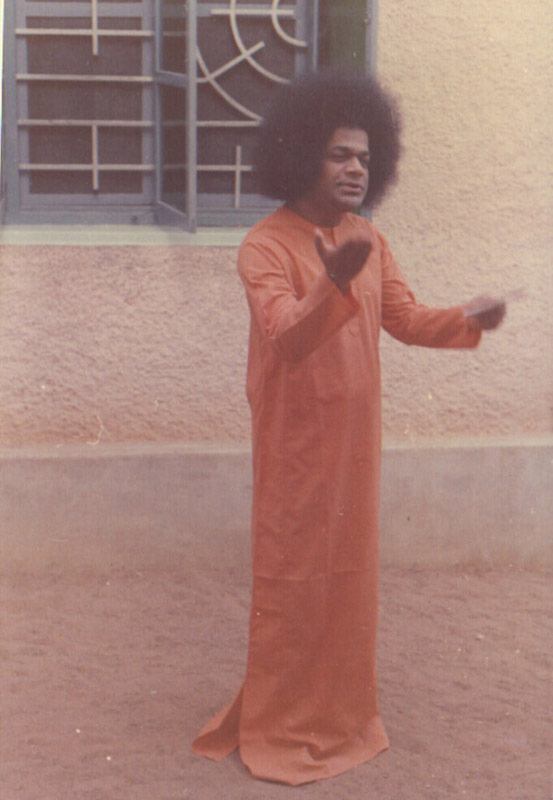 In Clip-1, Bhagawan defines who a true Bhaaratheeya is. Clip-2 is about the tradition of offering our respect and salutation to any work before commencing the same. Clip-3 and Clip-4 give the inner significance of offering coconuts to God when we visit temples. In Clip-5 and Clip-6, Bhagawan explains the true purpose of tying green leaves festoons during festivals. In Clip-7 and Clip-8, He explains the inner significance of spraying cow-dung water in front of our homes. Clip-9 explains the inner significance of smearing turmeric on the dorrsteps of houses, while Clip-10 gives the inner significance of women, in olden days, smearing turmeric on their faces. Clip-11 is about the principle behind having low doors for big mansions in ancient times whereas Clip-12 is about the need to perform Bhoota Yajna wherein we raise pets, take good care of them and also feed insects and animals. 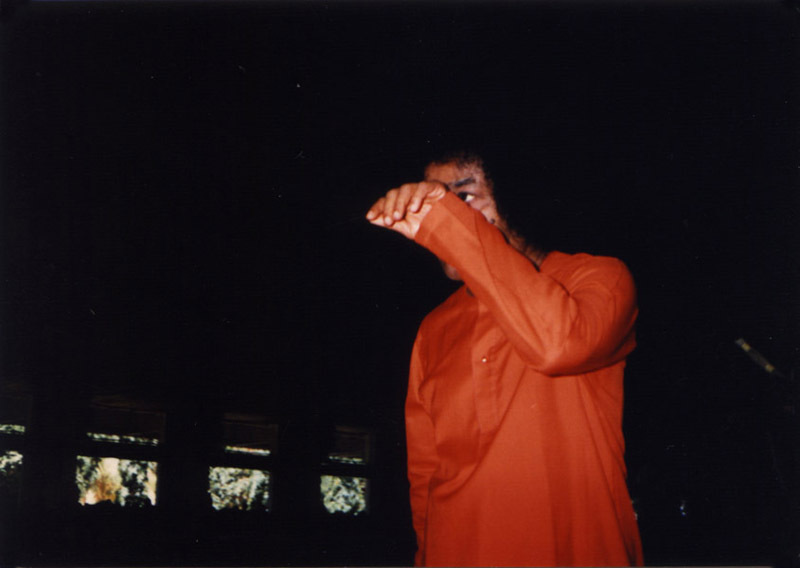 In Clip-13, Bhagawan narrates a very humorous anecdote to illustrate the significance of the Sandhya Vandanam (a religious practice performed by Hindu men initiated into the rite by the ceremony of Upanayanam – Sacred Thread ceremony) ritual. Finally, Clip-14 tells us about the inner significance of waving the camphor flame (called Arathi) in front of God. Embodiments of Love! When people from every part of the world have gathered here at Prasanthi Nilayam to rejoice in a great celebration, they are being considered as “foreigners” and the residents of Prasanthi Nilayam as “natives”. Who are the natives and who are the foreigners? When this difference is examined, it will be seen that wherever Truth and Righteousness are being promoted and manifested, people there are to be deemed as Bhaaratheeyas. By merely taking birth in Bhaarath, people do not become Bhaaratheeyas. Bhaaratheeya culture proclaims the two virtues: Sathyam Vada; Dharmam Chara (speak the truth; follow righteousness). Whoever adheres to these two principles is a Bhaaratheeya. During Upanishadic times, people would offer their salutations to the karma (action) before undertaking it --Thasmai Namah Karmane (salutations to the action). We have to offer our salutations to the action in the first instance so that the action gives us good results. 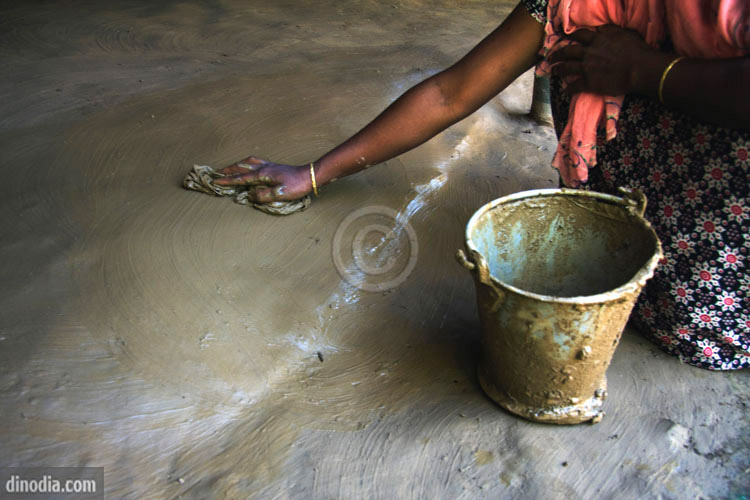 In Bhaarath, people follow this sacred tradition even today before starting any work. A cricket player pays his respects to the ball before starting to play. A dancer salutes the anklets before tying them to her feet. Even an uneducated driver offers his obeisance to the steering wheel before driving the vehicle. These are all ancient traditions and culture. But today, we are forgetting these ancient traditions and culture. That is why accidents are on the rise. There is a sense of fear and delusion among people everywhere. What is the reason? We are not saluting to our actions first. First of all, we have to offer our obeisance and then pay our respect to the action so as to express our gratitude before undertaking it. 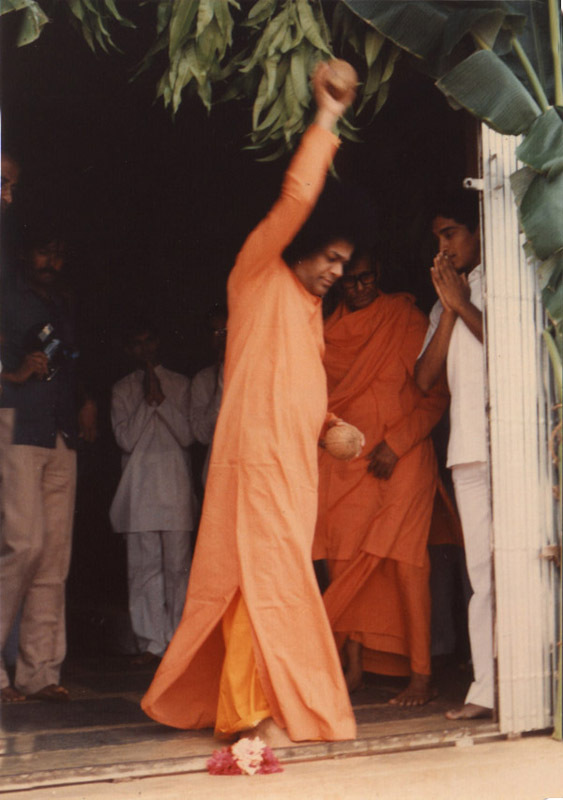 Before you start any work, you must salute that work and then start working (Here Bhagawan corrects the translator saying – not salute. Respect the work). Therefore, every man has to understand his duty properly and discharge the same. Before the commencement of any music programme, musicians pray to Vinayaka. They do so in order to make sure that there are no obstacles. In many of the religious practices today, there is concern only for observing the external forms, with little regard for the inner significance of these rites. For instance, one wishes to offer a coconut to the idol in a temple. No care is taken to see whether the coconut is a good one or not. The mere breaking of a coconut, even if it is a rotten one, is considered enough for fulfilling the offering. Note the inner significance of the ritual. The coconut is a symbol of the heart. Before it is offered to God, all the outer fibre has to be removed. In the spiritual sense, this means, removing the Tamasic tendencies from our heart. The shell of the coconut symbolises the Rajoguna in us. The white kernel inside the coconut represents the Satvaguna. What we have to offer to God is a pure heart, without the Tamasic and Rajasic qualities such as anger, hatred and attachment. It is this purity of heart that must be manifested in making any offering to God and not the mechanical breaking of a coconut as a meaningless ritual. The word Narikela stands for a coconut. Every Bhaaratheeya must grasp the inner meaning of offering a coconut to God. We never offer the coconut as it is. We remove the fibre that covers it and offer the fruit that is free from all the external fibre. Only then is it possible to break the coconut. By breaking the coconut, the water in it flows out. The heart is the coconut and it is covered by the fibre of desire. The water that flows out is the samskara or purification (of tendencies). The fibres on the surface are the desires. We must strip the heart of all desires and offer the core without the fibre. It then becomes an offering to God. If we aim at a state of no birth and want liberation from the cycle of birth and death, the core of the coconut acquires a different significance. If we plant a coconut as it is, in course of time, by watering it, another plant will grow out of it. At the time of germination, there is water in it. At that time, the kernel will be clinging to the sides of the fruit. The water in due time gets dried up and the kernel shrivels and begins to drift away from the external surface of the coconut. If we try to get the kernel out, plant it and water it, nothing will happen. Our body may be compared to the shell and our life to the kernel. Our samskaras (tendencies) are the water inside the coconut. As long as there are samskaras within us, the heart will always cling to the body consciousness just as the kernel clings to the fruit. Since ancient times, in Bhaarath, traditions are being adhered to implicitly. People decorate their houses with buntings of green leaves on festival days. This practice assumes great significance in the state of Kerala. Big pandals (fabricated structure during religious ceremonies) of green leaves and plantain stalks and leaves are erected. Green leaves are given place of prominence in such decorations. This decoration is done during marriages too. Why do we decorate with these green leaves? Can't we pay some money and have a Shamiana (popular Indian tent shelter) instead? No, that is not in accordance with our ancient tradition. What is the logic behind this decoration of pandals with green leaves and green festoons? At the time of marriages, many people gather at one place. As you are aware, we inhale oxygen and exhale carbon dioxide. Too much carbon dioxide in the air affects our breathing. The green leaves absorb this carbon dioxide and release oxygen. In this manner, they bestow health and happiness on the people. Thus, every tradition of Bharat has a profound inner meaning. Such sacred traditions are forgotten today. Wherever a function is being performed or a big meeting is held, people prefer decorative Shamianas to Pandals. It may be aesthetically pleasing but serves no other purpose. Even in small homes, they tie green festoons at the entrance of the main door. Why? Because these green leaves festoons bestow good health and happiness on man, apart from being aesthetically pleasing. This gives us great enthusiasm and joy. However, as per modern fashion, we make use of plastic leaves festoons. Can these plastic leaves absorb carbon dioxide and release oxygen? No. We are focusing only on the aesthetics without any concern for welfare and progress. We should therefore, never forget our ancient traditions. There are some practices that have a subtle scientific meaning. Our Bharatiyas, during festivals, marriages and other auspicious occasions; tie mango leaves, green leaves at the entrance door. We also tie plantain saplings. The foolish scientists, who do not understand the inner significance of this practice, wonder why these Bharatiyas so foolishly tie all these stupid things. They ask, “Why can they not tie plastic mango leaves that will remain permanent? Why should we cut these branches and leaves from the tree? Why should we destroy them? Instead we can tie plastic festoons”. It is not that. Our ancients were not foolish. They were highly intelligent, wise and full of Divine feelings. The inner meaning of this practice is that, when ten (or so) people assemble together, the atmosphere gets polluted. When they breathe out, they release carbon dioxide into the air. This carbon dioxide spreads across to all and proves harmful to them. The green leaves (tied as decorations) take in this poisonous carbon dioxide and release oxygen. Therefore, when many people gather at a place, the green leaves prevent the air from becoming poisonous (on account of CO2) and keeps it clean and pure. Today the houses are built in a modern fashion with big halls, doors and windows. But in the past, houses were not built in that manner. In ancient times, houses had very small doors. In these small houses, when 20 and odd people would assemble on occasions such as a marriage, the breath exhaled by them would make the air poisonous. The green leaves would take in all this carbon dioxide and release fresh oxygen into the air. It is having this meaning in their view, that the elders started this practice of tying green leaves decorations. Can you call this foolishness? The one calls this (practice) foolish, is indeed a fool. When there is any festival, people sprinkle cow dung mixed with water in front of their homes. It is considered to be auspicious. Some even prepare Rangoli (decorative designs) on the floor. What is the reason for spraying cow dung water? Cow dung destroys disease-causing germs and keeps them away because of its odour. Cow dung can cure many diseases. Today people of other countries have recognised this truth and are taking full advantage of it. But the Bhaarateeyas are not making efforts to understand its importance. In earlier days, cow dung was used as a remedy for wounds. People used to bandage the wound with cow dung. In modern times, people have a wrong notion that the wound would become septic if cow dung is bandaged over it. It may become gangrenous also leading to amputation, they argue. No. This is not true. If cow dung is applied, the wound will be healed in three days. Cow dung has such sacred power. Even cow urine has sacred properties. It is mixed in water and sprinkled on people infected with pox. But people despise such remedies. These remedies, in fact, are beneficial to one and all. The Bhaarateeyas have to revive such ancient traditions. Let people say what they want, we have to follow our sacred traditions for our satisfaction. In olden times, there was a practice that on festivals and other auspicious occasions, cow-dung mixed with water used to be sprinkled at the entrance of the houses. Today we think, why should we sprinkle this cow-dung paste, can we not lay a marble or marblex floor and keep the place clean and tidy? No. No. This cow-dung has antiseptic property; it has the power to kill (microorganisms). When the cow-dung paste is sprinkled at the entrance of the homes, poisonous insects and organisms around the houses would get destroyed. Thereby, people progressed with good health. Let any scientist today experiment with the use of cow-dung. Unfortunately, they do not experiment with cow-dung. They instead experiment with the sun and the moon. The mindless scientists experiment with objects that lie crores of miles away from us, instead of experimenting with organisms that lie so close to us and cause harm to us. Thus, our ancients started all these practices to correct and promote a sacred, healthy and happy life for mankind. In the past, women made extensive use of turmeric powder. They used to smear the doorstep with turmeric and place kumkum (vermillion) on it. These have antiseptic properties, the power to destroy (microorganisms). They helped to destroy any microorganisms and insects that would otherwise enter the houses. Today we ask, “why should we apply that turmeric, is it not enough if we use yellow paint”. The yellow paint may help to decorate, but it does not have the (antiseptic) power to kill. Thus our ancients had some inner meaning and scared use in every small practice that they initiated. By smearing turmeric, the faces (of the women) would take on a golden complexion. The application of turmeric also helped to prevent the growth of hair on the face. The antiseptic properties of turmeric and vermillion helped in preventing any microorganisms from getting into the body through the nose or the mouth. By the giving up of these practices today, diseases like Eosinophilia and asthma are spreading, as microorganisms are entering inside the body easily. Health and happiness are the two goals of life. Only when we are healthy, can we be happy. If we go on speaking like this, in our Bharatiya culture, there are so many day to day practices that lead only to welfare and cause no harm. Do you know the ancient customs and traditions? They used to build big mansions with small doors. Do you know why they kept such small doors? We think that these small doors were placed to prevent thieves from entering the houses and escaping with ease. No, that was not the reason. These doors were purposely kept low to enable the visitors and guests to observe the custom of entering the houses with their heads bent in reverence to the inmates. Even the windows and doors of homes teach the lesson of respect. Such ancient traditions have been forgotten today. Nowadays you will not find even a ‘gadapa’ (threshold) to the door frame of the main entrance to the house. They think that the threshold is an unnecessary hindrance to enter the house. Why the extra effort to step over and cross the threshold? No, it is not a hindrance at all! In ancient times, they would keep broad thresholds at the doorstep. Again people think that these thresholds were placed to prevent thieves from entering the houses and escaping with ease! No. No. Whether we go to the houses of others or whether others visit our homes, we all need to bend our heads in respect and enter the homes. This is the true reason and not preventing escape of thieves. The ancient traditions of Bhaarath are thus practised with utmost humility, obedience and sincerity. When we take a bath, wash our clothes, or sweep the house, many living creatures may be losing their lives. To atone for the death of such creatures, Bhoota Yajnas (offerings to the Bhoothas - Beings) have to be performed to satisfy these creatures. This practice has come down from the times of ancient sages. The rishis used to maintain satvic animals like deer, peacocks and cows in their ashrams and look after them with loving care; both for their own requirements and also as an expression of their love for them. Following this tradition, people used to scatter sugar or flour near the anthills for feeding the ants. To offer the remains of one's food after a meal, to birds or dogs or other creatures is also a form of Bhoota Yajna. Even today many people keep cows, dogs, birds or other pets at home and take good care of them. By showing love towards living things in this way, some atonement is made for the unconscious harm done to various creatures in daily life. The modern students do not understand our ancient culture. How sacred it is. Samasta Lokaa Sukhino Bhavantu. Our culture always prayed for the welfare of all beings. In one home, there was an old man, a grandfather, who followed his rituals strictly and performed his prayers (Sandhya Vandanam) in the prescribed manner, early in the morning and at dusk. He had a grandson, a modern boy, who used to sit in the verandah doing his day’s homework, dipping his inkpen in the inkbottle every time he wrote a few lines. Regarding this as a part of the modern education trend, the grandfather did not specifically converse with him. As the house was small, in the evening, the grandfather came out to the same verandah and taking spoons full of water, started chanting the mantras, “Kesavaya Namah, Madhavaya Namah, Narayanaya Namah, Govindaya Namah, Madhusudanaya Namah" etc. Taking water from a little vessel, he sipped a spoonful at a time with each mantra, as per the ritual. Today’s students neither know their own job nor understand the work of others. This kind of general knowledge has to be acquired by direct experience, not from any institutional study. Hence try seriously to understand the significance of our ancient culture. 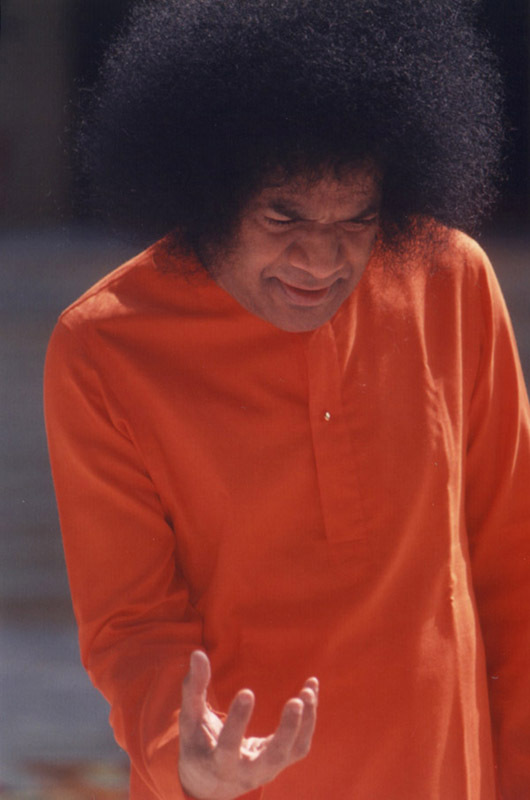 The waving of the camphor flame at the end of the bhajan sessions is to remind you that your sensual cravings must be burnt away without leaving any trace behind, and you must offer yourself to God for being merged with His Glory. 01-Who is a true Bhaaratheeya according to Bhagawan? 02-Why should we salute to every action before we perform the same? Can you think of some examples of this principle in action in our day to day life, other than those stated by Bhagawan. 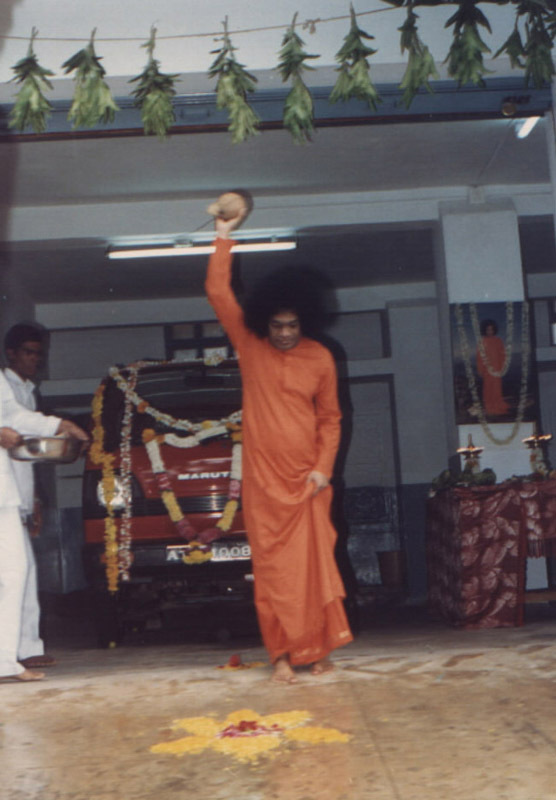 03-What is the inner significance of offering coconuts to God in temples or elsewhere? 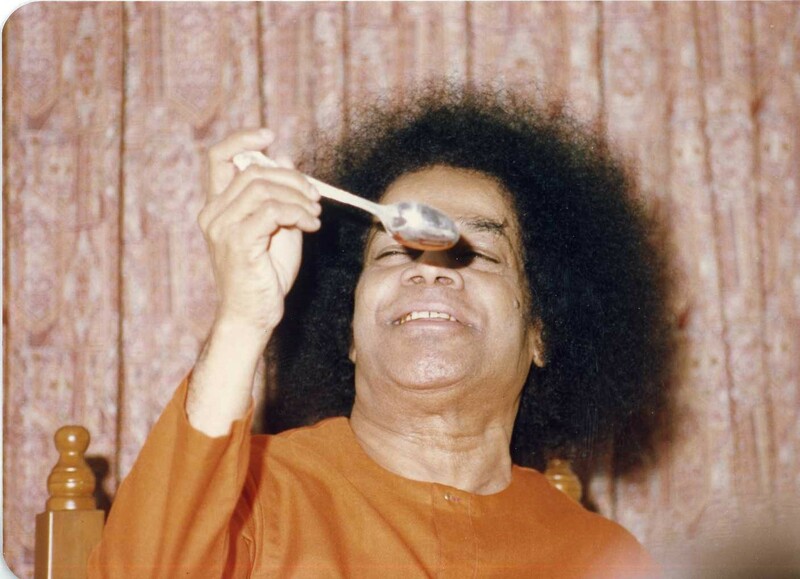 04-What is the analogy that Bhagawan draws between a coconut and our human body? According to this analogy, what is the way to escape from the cycle of birth and death? 06-What are the sacred qualities of cow dung and cow urine? In what ways are they beneficial to humans? 07-Why does Swami call the scientists mindless? 08-Why did women, in olden days, smear turmeric and vermillion on the doorsteps of their houses? 09-What are the benefits of women smearing turmeric on their faces? 10-Why did big mansions have low doors in ancient times? 11-What is Bhoota Yajna? Incidentally there are five types of daily Yajnas and Bhagawan has extensively spoken about them. Can you name the other four. 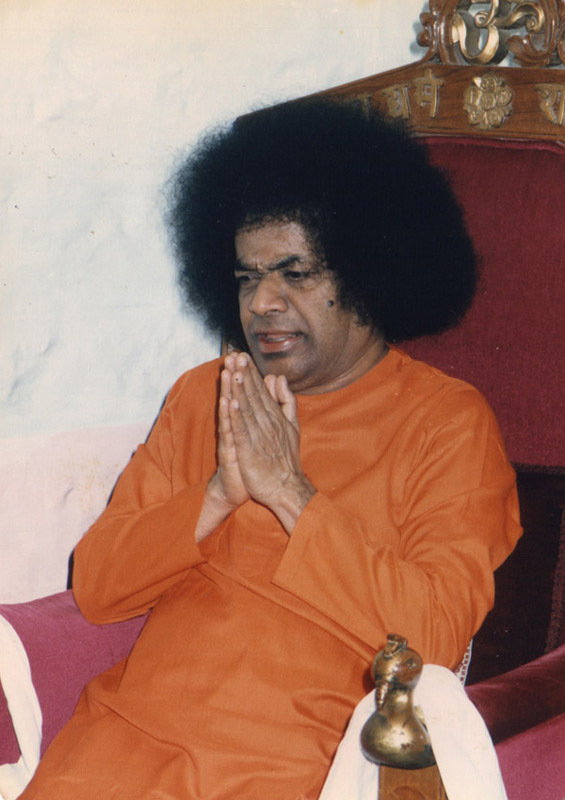 12-What is the lesson Bhagawan communicates through the story of the old grandfather and the modern grandson? 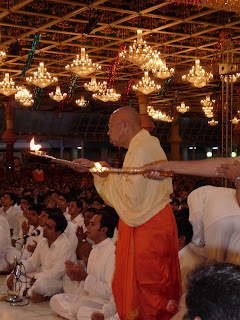 13-What is the inner significance of waving the camphor flame (Arathi) in front of God? This made very beautiful reading. Thanks for the inspiration to seek out and cherish the significance in our traditions and culture. I hope we can add more to this list with time.